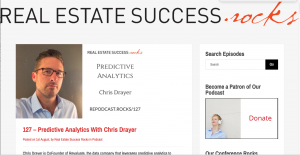 I was honored to be invited by the great Patrick Lilly to talk Predictive Analytics on his podcast. We also discussed candy, swiping left on Tinder, hookups and how Revaluate works in Real Estate. What a cool opportunity and a good time. It’s a tight episode, Take A Listen.